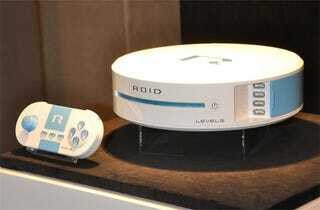 Level 5 Joins The Console War With "ROID"
That "shocking" announcement that Professor Layton and Dragon Quest VIII developer Level 5 had planned for its "Level 5 Vision 2008" show was likely the debut of ROID, a new gaming platform it's working on with NTT DoCoMo, Enterbrain and Famitsu. Just kidding! ROID's not really a gaming console, despite photographic evidence that would prove otherwise. It's merely a web portal that will sell games for the PC and mobile platforms. Yes, it's totally snoozeworthy and not news you can use. But did you know that ROID can transform into a robot?! Zounds!